Since the Soberanes Fire in 2016, various popular trails in Big Sur have been closed for restoration efforts and trail maintenance. Despite these closures, there are still other beautiful hikes currently open and accessible to the public this summer. Whether embarking on a strenuous backpacking trip through the redwoods of the Ventana Wilderness of Los Padres National Forest or strolling beside waterfalls, locals claim that it is hard to go wrong when choosing a hike. 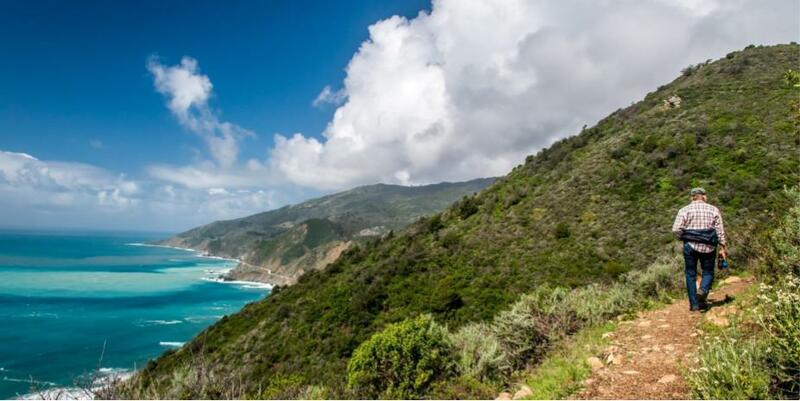 “My favorite Big Sur hiking trail would have to be the Ewoldsen Loop, which is located in Julia Pfeiffer Burns State Park,” says Nathan Ober, Big Sur local and volunteer for the Henry Miller Memorial Library. The Ewoldsen Loop is one of the most popular hikes in the Big Sur area and offers world class views of the 80-foot-tall waterfall known as McWay Falls. According to Big Sur trail expert John Iverson, whenever friends or family visit Big Sur, an ideal day would include a short hike to McWay Falls and then a trip to Limekiln State Park. Scenic campsites are available in the park with access to trails that meander through the 716-acre property. There are two trails to choose from, but if hikers are in a hurry, Iverson recommends the popular Limekiln Trail. Toward the end of this picturesque trail, visitors can visit the historical remains of 19th-century kilns used to produce the material from lime for tanning hides, according to the trail expert. “This is not a very challenging trail, but it has some of the most beautiful redwood groves and streams in the area,” Iverson says. Although it is not extremely strenuous, it still has moderate climbs and hikers should be prepared with the appropriate hiking gear. The community along the coast is closely connected to the rich ecosystem and history of the area. Whether that includes the Henry Miller Library’s dedication to educating the public about the environment or Carmel High School’s very own Hiking Club, this relationship is unique. The most recent hike the club has taken would be Andrew Molera’s East Ridge Trail on the west side of Highway 1 just before the River Inn. The hike was quite popular among the CHS teachers, family and students. Although there are various trails that are perfect for a short day adventure, the Big Sur area offers its fair share of opportunities for day-long expeditions. For those looking for a more challenging hike, the Big Sur trail expert recommends exploring Vicente. The hike totals 10.8 miles, and it offers 180 degree views of the ocean and an incredibly diverse array of scenery and wildlife. This hike begins right across from the picturesque Kirk Creek Campground, nestled right along the ocean with beach access. Due to the popularity of many campsites, reservations are recommended. If you are planning to do an overnight backpacking trip, make sure to consult the ranger station for information about permits and trail conditions.